This will get you caught up for the first episode of Season 4, which premieres on our main OETA-HD channel Sunday, March 29 at 7pm. 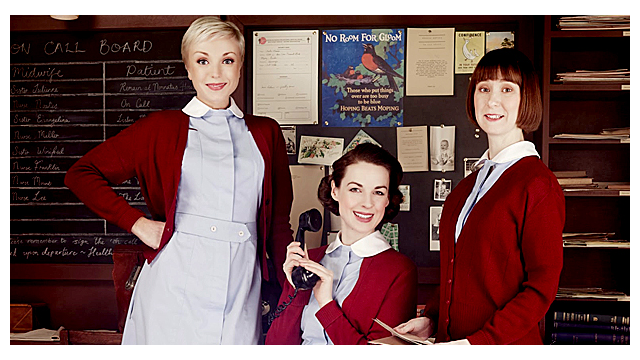 Are the midwives and nuns ready for the 60s? We'll find out! Season 4 will have eight one-hour episodes, each one premiering on Sunday evenings at 7pm. Each one repeats the next night on OKLA, also at 7pm. * OKLA is free to all OETA viewers. It is available over the air as our second channel. It's 13.2 in the Oklahoma City area, 11.2 in Tulsa, 3.2 in Eufaula, and so on. If you have Cox Digital Cable in Oklahoma City, it's channel 112. If you have Cox Digital Cable in Tulsa, it's channel 1083. Some other cable companies carry the OKLA channel. If your cable company doesn't carry OKLA, call them and suggest it. Unfortunately, no satellite providers nor AT&T Uverse carry OKLA or our other extra channels, OETA Kids and OETA Create.